This HowTo gives you a quick instruction on how to get a demo of djangocms-cascade up and running. It also is a good starting point to ask questions or report bugs, since its backend is used as a fully functional reference implementation, used by the unit tests of project. Point a browser to http://localhost:8000/?edit and log in as the super user you just created. Hit “next” and fill out the form to create your first page. Afterwards, click Structure on the top of the page. A heading named Main Content appears, it symbolizes our main django-CMS Placeholder. 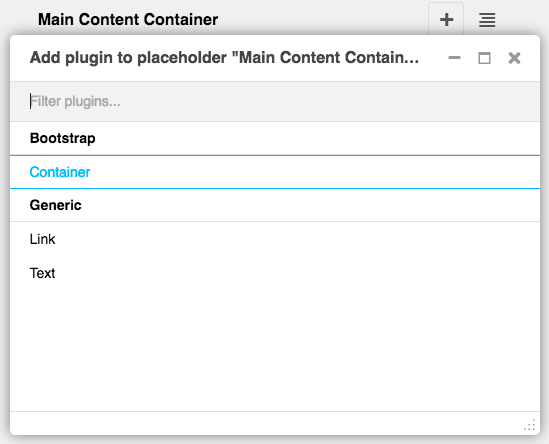 This brings you into the editor mode for a Bootstrap container. To this container you may add one or more Bootstrap Rows. Inside these rows you may organize the layout using some Bootstrap Columns. Please proceed with the detailled explanation on how to use the Bootstrap’s grid system within djangocms-cascade.